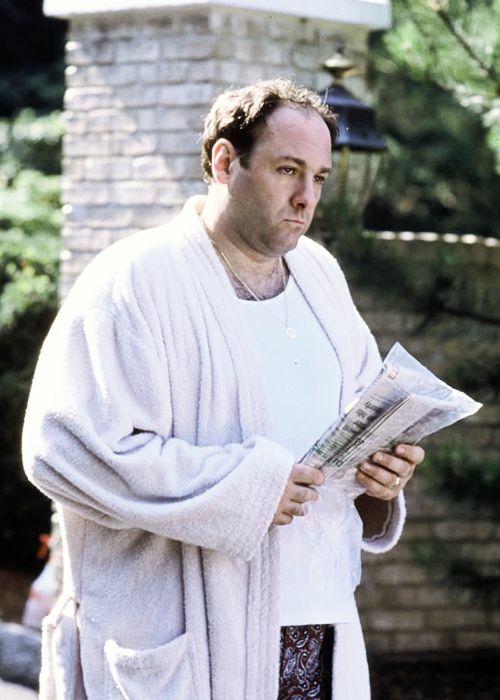 The most enduring visual from the classic HBO series The Sopranos is that of Tony Soprano wearing a wife beater and boxer shorts, his thin bathrobe draped over his heavy set frame like a silk sheet covering old furniture – that mix of caustic male power fused with silent, understated anger (played to perfection by James Gandolfini) is a portrayal of male power and dominance that television audiences will never forget. The Sopranos is David Chase’s breakdown of toxic masculinity, of gender power play, of dominance and looking back on it with our 2018 specs on it’s clear that the show was ahead of its time – not just by being a luxuriously made movie-quality TV drama but also in its complex psychological profiling of a man beset by quiet, self-destructive masculinity, a parable we’re becoming all too familiar with in a culture still reeling from the fallout of Harvey Weinstein. But in many ways a show like The Sopranos couldn’t exist in the same format now. By presenting a varied, complicated portrait of Tony Soprano it immediately votes itself out of our instantly consumable binary internet culture. Tony isn’t easily categorized into hero or villain tropes – instead, his toxicity is framed as a disease that subtly fuses with all the decisions he makes – for better or for worse. Tony isn’t just a domineering chauvinist, a terrible husband or a homophobe – he’s also a wisecracking powerhouse, a proud traditionalist that fiercely protects his own and a flawed family man whose fight with depression is never-ending. In one breathe we’re treated to the incredible depths of Tony’s barbarism and then his humanity all at once. And often in our world, despite what social media tells us, our villains are often our friends. They are people we know hidden in plain sight, with decades of pain being the emotional fuel for all of their worst traits. The unique hook with The Sopranos is that it’s a psychological reading of traditional mobster bad guy tropes. Tropes that have a sheen of roguish romanticism to them thanks largely to excellent films like Goodfellas. But on Dr. Melfi’s couch, Tony Soprano’s huge list of flaws are laid bare by a situation that strips away his power and leaves him alone in a darkened room with only a stage light for company. The genius of the therapy sessions Tony is subject to means the sinister romanticism is gently ebbed away. The bravado falls apart under the cold scrutiny of Melfi’s psychological gaze. By drawing parallels to the mistreatment and emotional abuse of Tony’s mother, suddenly Tony Soprano is less of a villain and more of a human who has been left for dead by the long winding road of emotional malnutrition. But that’s to say nothing of the real victims of this show – Many people are executed in true gangster fashion but no one suffers more than the women that decide to put up with the incredible moral pit of the Soprano family. Adrianna, for example, is a long-suffering domestic abuse victim at the hands of Christopher Moltisanti and despite her ambitions for greater things she feels kinship and loyalty to a man who repays her with physical violence. Carmella, too, is similarly rewarded for her loyalty and even in later seasons when that loyalty is put to the test, she remains true to the Soprano name, perhaps out of love, but also maybe out of fear of reprisal. That’s to say nothing about the myriad of girlfriends and mistresses that court the Soprano men, many of which are treated with about as much respect as a dog with mange – often left on the outskirts of their lives and pushed out of the airlock when their needs have been met. And even with this bleak treatment, not all the women are suffering – Indeed Tony’s own mother is a primary source of nastiness and bile in her own right. So much so that Dr Melfi constantly digs into Tony’s relationship with his mother as a potential boiling point for much of his rage and existential anguish. Livia has a persecution complex dangerously combined with a vicious mean streak which enacts itself on everyone in the show, especially Tony. But the cultural stigma around respecting your elders puts a blindfold on much of the abuse Tony is subject to as a child. Additionally, his sister Janice is introduced later on in the show and quickly turns the air green with divisive manipulation and self-centered scheming. Janice almost seems like Livia 2.0 and likewise, her return to Soprano life is viewed with a rather large mound of suspicion by Tony. It’s perhaps the greatest success of The Sopranos, as with all great art, that the subject does not have some miserable moral sentencing passed down upon them by the storyteller, nor is the audience’s intelligence insulted by constant biblical morality plays – instead David Chase presents a complex system of cause and effect, of psychology, nature vs. nurture, of childhood memories fusing with adult feelings – and once it’s all thrown together in to the bubbling dramatic soup of The Sopranos, suddenly it’s less about putting our heroes and villains into easily digested boxes and more about analyzing the route causes and the harmful sources that influence much of the moral excess that suffocates our respective societies.